The following is best practice advice and recommendations for the installation of industrial flooring screeds. Please note: Substrate must have a minimum pull-off strength of < 1.5 N/mm² (MPa). Apply two coats of weberfloor 4716 primer dispersion both diluted to a ratio of 1:3 (concentrated primer to clean water) on to the substrate (concrete or cement screed). Please note: Some substrates might require more priming due to their porosity. If so prime first time with 1:5, for example. The primer must be brushed on to the cleaned substrate avoiding ponding — please see datasheet for details. If the substrate is very rough and uneven, it requires a base layer. 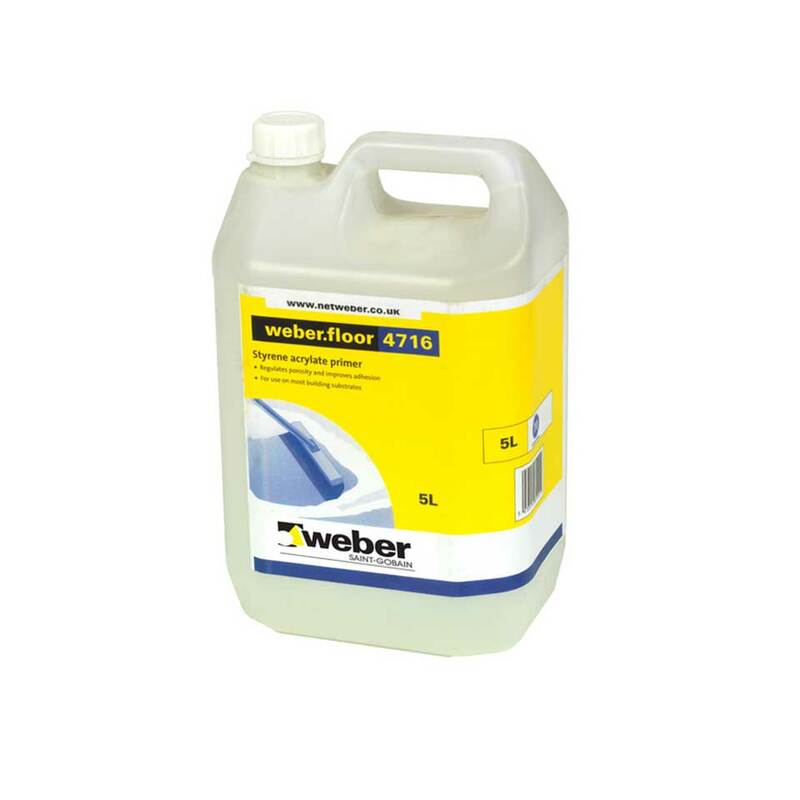 Use weberfloor 4360 base flow rapid pumped on to the substrate to the required thickness in sections 6 to 8 metres wide. When filling the sections be sure to advance in strips, adding each new strip to the old as quickly as possible, so the material can merge. Afterwards, level out the surface while it is still fresh, using a wobble bar or flat spatula. Follow the product data sheet. The base layer must then be primed using weberfloor 4716. Please note: Always pump the products with a continuous mixer pump. The volume of added water must be specified on the continuous mixer. Check the correct volume of water to be added before and after application (see Product Data Sheet). 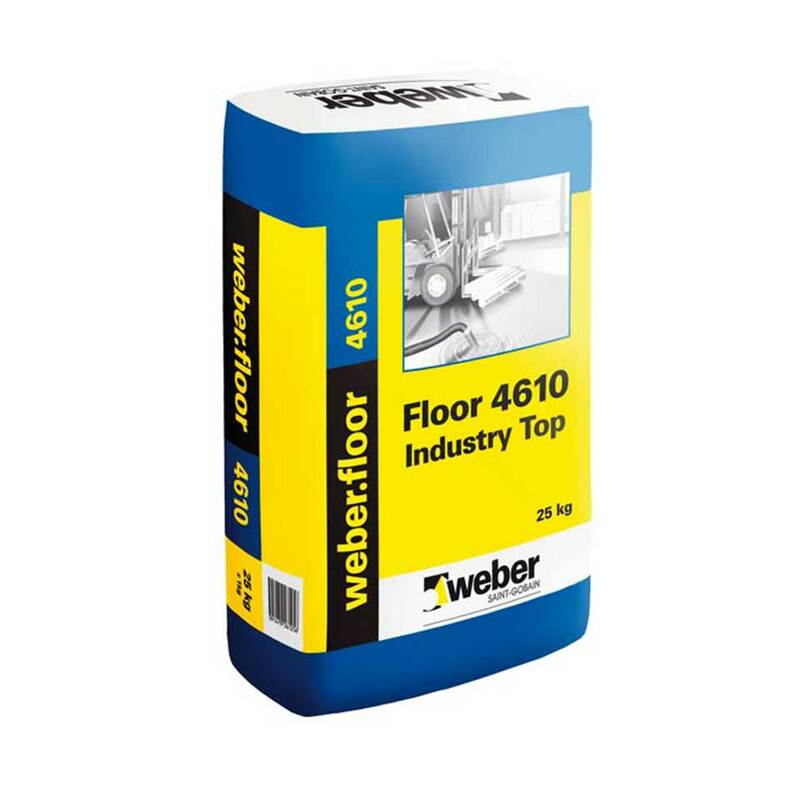 weberfloor 4610 industry top is pumped on to the substrate to the required thickness, normally 8-10mm, in sections of approximately 6 to 15 metres wide. When filling the sections, advance in strips so that each new strip is added to the next as quickly as possible to enable the compound to merge. Afterwards, level out the surface while it is still fresh, using a notched trowel or spatula. Pump weberfloor 4655 industry flow rapid on to the base to the required thickness in sections of approximately 6 to 15 metres wide. When filling the sections, advance in strips so that each new strip is added to the next as quickly as possible to enable the compound to merge. Next, level out the surface while it is still fresh using a notched trowel. Interruptions to the work process must be avoided. Do not mix different batches for areas that are connected. Please note: Always pump the products with a continuous mixer pump. The volume of added water must be specified on the continuous mixer. The accuracy of volume of water added must be checked before and after the mixing process (see Product Data Sheet). To ensure a straight joint between the sections, we recommend first pumping the material (weberfloor 4610 industry top) into every second section (for example first, second...). Then removing the foam barriers and masking the two edges of the middle section with masking tape (minimum width 50mm) 6 hours after pumping at the earliest. Immediately after, pump the material into the remaining sections. Remove the masking tape after approximately 30 minutes. Air dehumidifiers, draughts and too high temperatures must be avoided. weberfloor 4360, weberfloor 4610 industry top and weberfloor 4655 industry flow rapid are cement-based materials that may be used immediately. As a result, the shade of the hardened flooring surface may vary with use of different raw materials. Slight variations in colour may occur during the laying process due to, for example, fluctuations in the volumes of water added or surface processing. When impacted by dirt or liquid agents, the surface reacts like a dense concrete surface. Movement and expansion joints must be carried through from the substrate. In the case of industrial use, dummy joints may develop into spontaneous joints. When overlaying the dummy joints, cracks may occur. Cracks may occur due to the consistency of the substrate and if layer thicknesses are exceeded. Small hairline cracks may occur due to the building shape or the substrate. These are purely optical flaws and have no influence on the floor's adhesion or loading capacity. Early point loads during the first week may leave small indentures since the material is still in the process of curing. Rapid reconstruction of stores with cement-bonded floor coatings as final flooring material - for internal use.